“What telling there is is always good . . . 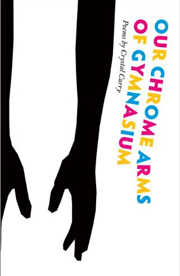 But, my heart holds out for a mobilization frenzy,” Seattle-based Crystal Curry carefully projects in the preface of her latest, most complete, and most completely disruptive book of verse, Our Chrome Arms of Gymnasium. Pulling the cover open is like entering an enthralling, mysterious cave and finding a microcosmic reality waiting within. Every element of the world appears familiar, but the lighting is quite selective. Truths come in hyper-conductive shrieks. There is something in the air that makes these speakers imminent soothsayers. An established right of way is clearly dominant, and yet, in Curry’s realm, the end is nigh for comfort. The personas in Curry’s poems latch on to their dynamic and unstable environments, giving those nearby stability through maddening, distinctive promises. In the tricky “Brigadier Rory Gentle,” the acidic tone leads the speaker into rules of reassurance for the audience: “We’re a fit fit fit & what you’ll think you see in my centurion slide out, is my shoe. / Grapple with the order, hoary morality, shoot up the ballroom, shake down the latrine. 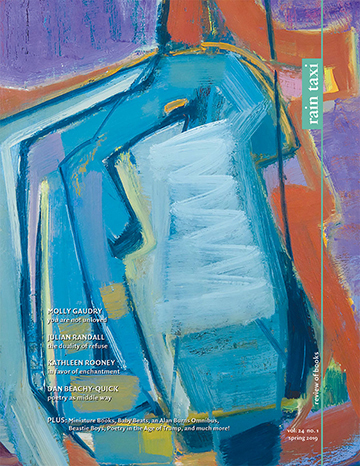 / I’ll cinch my shorts, Fort Trocadero, bar the door, tuck in safe, the rusting heirlooms.” In a world of decay, Curry’s words are able to invoke Pound, Duncan, and Olson, as well as more present influences like Ashbery and Iijema. The charge for admission: lip, Tom Collins or tongue. Molding into the base of the text is metrical skill rubbed over an appreciation for form that is flicked around to spread a snarling mode of speech, one fit for a heroine or fallen angel. This voice rises and falls from poem to poem and can be found everywhere in the text, binding it together. I am bullet shells. I’m a frigging anachronist. I aligned myself with the inner ear. I pried your damned prick from my liminal ear. I am prying your damned prick from my liminal ear. I will pry your damned prick from my liminal ear. This decrepit endurance is one of many examples of how Curry manages thematic weight in this book. As flashy as each speck of language is in each poem, the meaning circles all that “hapless demise / on the hovel door,” which lets us know we should be paying attention to the awkward, to the creepy, and to the familiar—and that we must concentrate on the process of liberation that leads us through each. There is energy to be found here, and the energy is in capturing something ecstatic, something human, “as it is the cure / for the tender maladies.” Allow yourself to find the maladies in this book and relate how they are stilled and defused. Stepping into this cave is an enticing opportunity, but sitting inside and exploring the crevices provides a more intense and rewarding experience.